How do you confirm if the brokerage is actually authorized/regulated in Australia? This simple guide will teach you how to check any broker’s license and understand what activities the broker is authorized to perform under that same license. 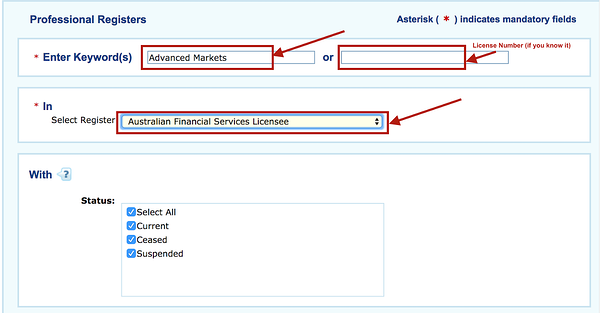 Go to ASIC register search and search for broker’s name or license number (if you know it). If the search comes back with no results, it might be that the firm does not have an AFSL license on its own and is assigned as an authorized representative under someone else. Reading and understanding license permissions. Once you have the search results you can view them online or download as a PDF. Apart from business registration address and service address, you also have a very important section named “License Authorization Conditions”. Condition: “Make a Market in financial products”, is a key area that you should be looking at. This means that the license holder is allowed to quote prices for listed financial products and to execute client orders. This may seem a little confusing at first glance, as for most of European jurisdictions, market-making means a principal, or “B book” model, where the broker is allowed to take the other side of the client’s order and warehouse the risk on its own books. In many other jurisdictions, there is a specific license type for STP brokers (a “matched principal” license under UK FCA) where a broker is only permitted to pass risk directly through to its liquidity counterparties for execution. 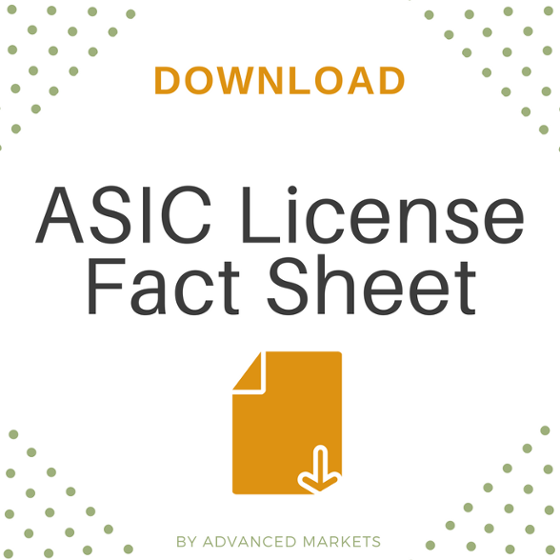 Under ASIC language however, to “make a market” does not signify a market-making brokerage business model, it is simply to note that the licensee is allowed to conduct a brokerage activity (price and execute clients). Permission is often confused to mean that the licensee is authorized to execute client trades when this is not the case. A license holder “deals” in a financial product when they apply for, or acquire a financial product, or if they issue a financial product. It could be easily interpreted as “a license holder is permitted to sell and buy financial products”. It also states what type of clients can be serviced: retail, wholesale, or both. Let’s take a look at another example (see Example 2), where the license holder is not authorized to actually execute client transactions. 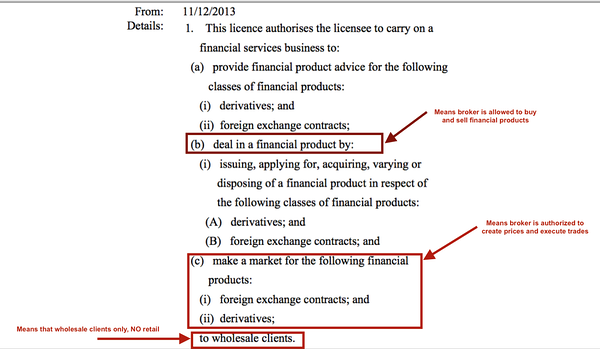 While the license is authorized to “deal” in financial products for retail and wholesale clients, it is limited to financial advice and MDA (managed discretionary accounts, or money management activities). Do not be misled, this is not a brokerage license and could not be used to open trading accounts or for the pricing and execution of client transactions. For some AFSL license holders, there may be some names appearing in the Representative section (see example 3). So what is an “AFS”, Authorized Representative, under an AFSL Licensee? AFSL License holders may authorize individuals, corporate bodies, partnerships or group of individuals (corporates) that are trustees of a trust, to be authorized representatives. Authorized Representatives can provide a specified financial service or services on behalf of the licensee, but the scope of these services is limited by the licensee’s license type. Therefore, if the licensee is not authorized to “make markets” (or, as we already learned, price and execute clients’ trades), authorized representative is not able to provide this service either. 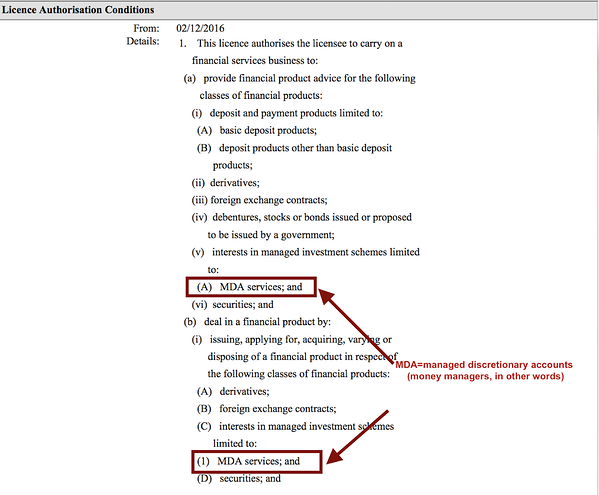 Example 4: Authorized representative authorized to provide advice for financial products. Contradictory to the popular belief, getting the designation of an “authorized representative” under an AFSL licensee doesn’t make you a fully-fledged brokerage operation in Australia. Brokers need to make sure that they are legally licensed and authorized in Australia before they start promoting products to clients. The Australian regulator, ASIC, has taken numerous actions to prevent unauthorized operators from targeting clients during the recent years. Example 5: Violation report issued by Australian regulator. Hope this guide helps you navigate the complex world of licensed FX brokers in Australia.